In conversations about SSL/TLS people often say that they either don't need TLS because they trust their network or they say it is too slow to be used in production. With TLS the client and server has to do additional work, so some overhead is expected. But the price of this overhead also gives you something in return: more secure communication and more authentication options (client certificates). SSL and TLS have existed for quite a long time. First they were only used for online banking and during authentication on web sites. But slowly many websites went to full-on SSL/TLS. And with the introduction of Let's encrypt many small websites are now using SSL/TLS. And many non-HTTP protocols either add encryption or move to a HTTP based protocol. So TLS performance is very important for day-to-day usage. Many people and companies have put a lot of effort into improving TLS performance. This includes browser vendors, hardware vendors and much more. But instead of just hoping for good performance: Let's try to measure it with a simple benchmark. Let's look at connection performance. In this test I connect a number of times to MySQL and do a "DO 1". This is on a localhost TCP connection, so it should be fast. This is the connection time in ms for a single connection. With 5.6.33 Community Edition, which is YaSSL based we see a very noticable overhead. And with 5.7.17 Community Edition this overhead is much smaller, but still very noticable. 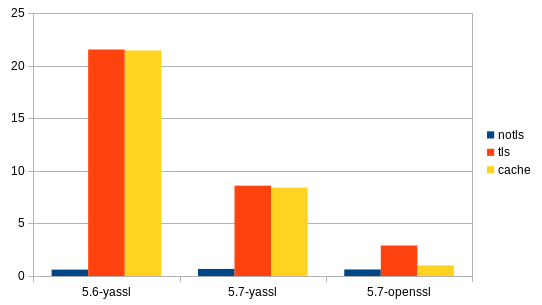 Then MySQL 5.7 with OpenSSL (compiled on Fedora 25) shows another very noticable improvement over YaSSL. This can be explained because in this case the AVX2 and AES-NI CPU features can be used. Also OpenSSL supports TLS tickets and YaSSL doesn't. This is why the yellow bar is much shorter that the orange bar. This is not yet supported in libmysqlclient, see Bug #76921 for details. So SSL/TLS can be slow, but doesn't have to be slow. The second thing to measure is bulk performance. This is for large result sets including mysqldump. This is with MySQL 5.6.33 with YaSSL. Note that this is without using modern CPU features etc. Try different cipher suits for mysqldump and other places where you transfer larger amounts of data. After securing application-to-database and replication traffic, you should also do the same for backup traffic. If you use Percona XtraBackup with streaming than you should use SSH to send your backup to a secure location. The same is true for MySQL Enterprise Backup. Also both have options to encrypt the backup itself. If you send your backup to a cloud service this is something you should really do, especially if it is not sent via SSH or HTTPS. And mysqldump and mysqlbinlog both support SSL. And you could use GnuPG, OpenSSL, WinZIP or any other tool to encrypt it. You could try to force the client to send credentials elsewhere. This can be done if you can control the parameters to the mysql client. It reads the config from /etc/my.cnf, ~/.my.cnf and ~/.mylogin.conf but if you for example specify a login-path and a hostname.. it connects to that host, but with the password and username from the loginpath from the encrypted ~/.mylogin.cnf file. You could use --enable-cleartext-plugin to make it even easier to get to the stored password. Note that if you have direct access to the ~/.mylogin.cnf file that there are options to decrypt it. See Bug #74545: mysql allows to override login-path for details. Make sure your machines use a private network (VLAN) which can only be accessed from cluster nodes. Your API nodes should be in this network and have a public interface where mysqld listens. Another option might be to use a firewall device or host based firewalls. Just make sure you are aware or the risks. As usual thers is extensive documentation about this: MySQL Cluster Security and Networking Issues from the MySQL Reference Manual. And use proper security for iSCSI, NFS, FCP or any other kind of network storage you might be using. I've seen setups where iSCSI and/or NFS were publicly available and even with data-at-rest encryption this is not really safe, especially if read-write access is available. In both MySQL 5.6 and MySQL 5.7 Oracle improved the SSL/TLS support a lot. There are more improvements needed as a lot has changed in how SSL over the past 10 years. Assumptions made years ago are no longer true. The mysql_sha256_password doesn't use the nonce system which is used for mysql_new_password, but instead forces the use of RSA or SSL. 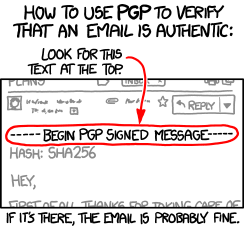 The server sends the RSA public key. The client encrypts the password with the RSA public key and sends it to the server. The server decrypts the password with the private key and validates it. The problem is that the client trusts public key of the server. It is possible to use --server-public-key-path=file_name. But then you need to take care of secure public key distribution yourself. So if we put a proxy between the client and the server and then have the proxy sent its own public key... then we can decrypt it and reencode it with the real public key and send it to the server. Also the decrypted password is the password, not a hash. So we then know the real password. And if SSL is used it doesn't do the RSA encryption... but this can be a connection with an invalid certificate. Just anything as long as the connection is SSL.